Poker Cheating and Casino Cheating Blog: American Roulette: Pennsylvania Casino Poker Dealer Caught Cheating His Tables at Rivers Casino! 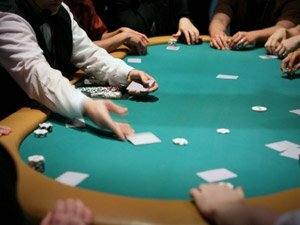 Pennsylvania Casino Poker Dealer Caught Cheating His Tables at Rivers Casino! Michael Eisenberg, a poker dealer who formerly worked at Pennsylvania’s Rivers Casino, was recently arrested for stealing poker chips from won pots. Eisenberg, who is just 25 years of age, was promptly fired from his job and is now facing theft charges. Though there’s no telling how long Eisenberg has been performing his misdeeds, the tipping point came when security cameras at the Rivers Casino clearly showed Eisenberg removing $501 from poker pots at his own table over the course of an evening. Security at the Rivers Casino became suspicious when Eisenberg’s tips quickly grew from under $200 per day to in excess of $500 per day. Eisenberg’s embezzlement strategy was actually quite simple. Each time a pot was awarded at his table, he would quietly grab a $5 or $1 chip from the pot as he raked in the folded cards. Eisenberg would the drop the chip into his tip jar, located under the table. Casino security cited Eisenberg’s greed as the reason for his eventual arrest, noting that his sleight of hand work wasn’t nearly as obvious as his sudden increase in average tips per day. Most casinos prevent this type of behavior by pooling dealer tips together and then awarding them equally to dealers at the end of a shift. In this way, there’s little incentive to steal money from patrons when the money will ultimately be shared with fifteen, twenty or more people at the end of the day anyways. There’s little doubt that the Rivers Casino will be changing its tip distribution policy following this incident. For now, the casino is remaining relatively quiet regarding the incident, likely in hopes of avoiding an excess of negative press. What do you think? Are cheating poker dealers pervasive enough in the live casino industry to warrant further scrutiny and anti-cheating measures from casino management? As patrons, we can’t do much more than carefully count our chips each time we win a pot.